At last! 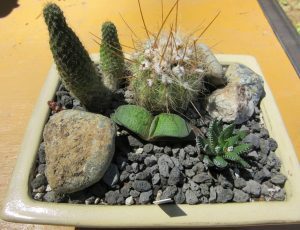 The weather our cacti and succulents have been longing for since last November: cloud free sunny skies, high temperatures, long days, little moisture. We have entered the Pacific Northwest drought period. Yep. It don’t rain all the time here. 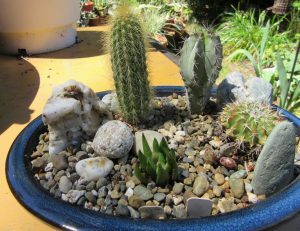 This is nirvana for our spiny ball cacti, euphorbia, agave, and other desert weather lovers. Our Haworthia and Gasteria have a rosy glow from their “suntans”. Buds have formed or flowers are in bloom and nearly every day we and the bees discover a new flower. Admittedly the blooms of Haworthia are nothing to post on Instagram, but they seem to represent the same zest for living as the large cereus and Echinopsis blooms. 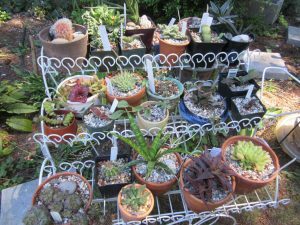 Another bonus is the absence of the mealy bugs and other critters that were becoming obnoxious by the time we brought the plants outdoors. All is not perfect, however, because we have traded the mealies for larger and more destructive pests: squirrels. While the cacti have been longing for summer, so have the squirrels. They started their families early in spring and now the young ones play tag through the pots, across the shelves and over and under the trays of baby plants. We love their joy and hate their havoc at the same time. It is truly survival of the fittest in our collections that move outdoors this time of year. While our plants are enjoying a resort vacation outdoors, our members are enjoying our monthly meetings which get us out of the classroom and into collections. In July we annually visit the Volunteer Park Conservatory for a walk through the greenhouses – including those behind the scenes. This is such a treat – to see how it’s all done and the unusual plants which aren’t on display yet. It’s one of our rarer meetings in that there is less camaraderie since we are spread throughout the several greenhouses. While plants are looking healthy and mostly happy, it’s a great time to create some dish gardens. It solves the problem of what to do with all the seed grown babies that might take up so many individual pots. Dish gardens are easy to make – remembering that the same horticultural rules apply as growing individual plants. Using pots with holes in the bottom, well draining soil (one mix is 50-50 potting soil without added fertilizer and pumice), and plants that generally like the same level of moisture. You can get around this in a dish garden by using an eye dropper to provide water to the thirsty ones while keeping it away from the plants not wanting that level of moisture. The seedlings started in January are making progress while still under their fluorescent lights in a squirrel free zone. They remain in their original pots with their siblings until 1-2 years old. 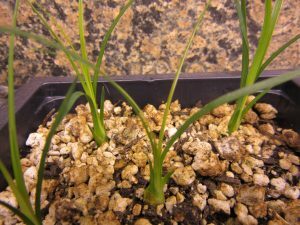 The one exception are the Beaucarnia recurvata seedlings which quickly grew to two inch height. After repotting and placing them in a protected area outdoors they are making quick progress, now about 4 inches tall. Beaucarnia recurvata seedlings at 6 months. Now twice as tall. Photo by Karen Summers. During this season we develop the most hope for our succulents, as we see them at their best, doing what nature intended them to do – and jealously admiring how they thrive in 90 degree heat.